Every company, to a greater or lesser extent, has to be about customer service. In the hospitality industry, it’s much simpler than that. Hospitality is customer service. The people who make or break that guest experience are, of course, your employees. And not so much your highly trained, top-dollar employees, but those on the phones and on the floors and in the rooms day after day after day, interacting face to face with your guests. Those are substantial stakes. It’s a grand opportunity if your employees are up to It. It’s a curse if they’re not. For the sake of your business, they have to be. And given the nature of their jobs and the miniscule margin for error in our digital, impatient age, they’re going to need all the help they can get. Let’s take a look at hospitality’s particular employee engagement challenges, and offer a framework for addressing them. Because asking employees to treat guests better than they’re treated themselves, or than they treat each other, is not a likely road to success. The nature of the game. It’s not too much to say that today’s guest expectations border on extravagant. They come into play in two ways. Not all that long ago, hotel selection was no more elaborate than whatever was closest to the off-ramp. Today, the smartphone has turned everyone into professional shoppers. Patrons think nothing of spending half an hour researching and making careful assessments based on price, convenience, reputation and previous experience. Several generations have now come of age in a world where everything is instant, information is plentiful and expectations are high. If your business doesn’t measure up to Amazon, so much the worse for you. The second, more critical expectation transcends the typical idea of customer service. Hotels propose to replicate the comfort of home, with guests paying other people to do all those things that make a home comfortable. The value proposition, implicit or explicit, is “We’ll take care of you.” That dynamic isn’t transactional. It’s quite the opposite: It’s personal. Stress meeting stress. It’s not hard to see why employees may not always meet the challenge. Many jobs in hospitality are hard; labor-intensive or repetitive or both. The pay is not always lucrative. The hours, to put it mildly, can be difficult. A frantic pace is not uncommon. And then there’s the notoriously high turnover rate. According to the Bureau of Labor Statistics, for example, last spring leisure and hospitality led all industries in job openings rate, hires rate, and total separations rate. Such constant change only serves to overburden remaining employees, leaving them limited energy for being cheerfully nice to guests 24/7. Where all this leads is stressed, possibly unmotivated employees in frequent contact with stressed, worn-out travelers and stressed, anxious businessmen and women. It doesn’t take a crystal ball to predict how these interactions might often turn out. Not a happy prospect, right? How do you get your establishment out in front of things like this? Setting the standard. Engaged customers come from engaged employees. There is no other source. And engaged employees come from a carefully cultivated culture of purpose, values, appreciation, ownership, and recognition. It doesn’t happen by accident. What’s needed is a program that does for your employees what you want them to do for your guests. Engagement has far too many facets to adequately discuss in this space, but one of the most pertinent for hospitality is the need for management to communicate how each employee’s role helps the business achieve its goals (in this case, high CSAT scores). When hospitality workers understand the impact of their service, they can discover meaning and value in their work. That’s how they realize that they, and not the genial general manager, nor the corporate logo on the glass entry doors, are the face of the company. And that’s immensely important, because when the promise is “We’ll take care of you,” seemingly little things, both positive and negative, become very big things. Just a seat? For example, in a clock-punching culture, a valet parking attendant’s failure to return the driver’s seat to where he or she found it doesn’t register as important. In a culture of purpose and engagement, where the company’s goals are clear, its values are communicated, and expectations of behavior are defined for every employee on the org chart, even the least-experienced or lowest-paid valet understands that “trivial” things are precisely how guests judge the quality of their stay. More importantly, that valet understands he has the power and responsibility to shape each guest’s experience. And when those small gestures are recognized, rewarded and reinforced, you’ll not only shape that employee’s performance, but others will take note and the culture of your organization will change. So now the valet makes sure the seat is right and the air conditioning is on as he hands the guest a water bottle as a token of appreciation. Such seemingly little things bring guests back, and create a big reservoir of goodwill to be drawn upon when something doesn’t quite measure up in the future. A contagious culture. Here’s a recent example of how a culture of appreciation and recognition can catch fire in a company literally overnight. It comes, appropriately, from a hotel—although of the floating variety. 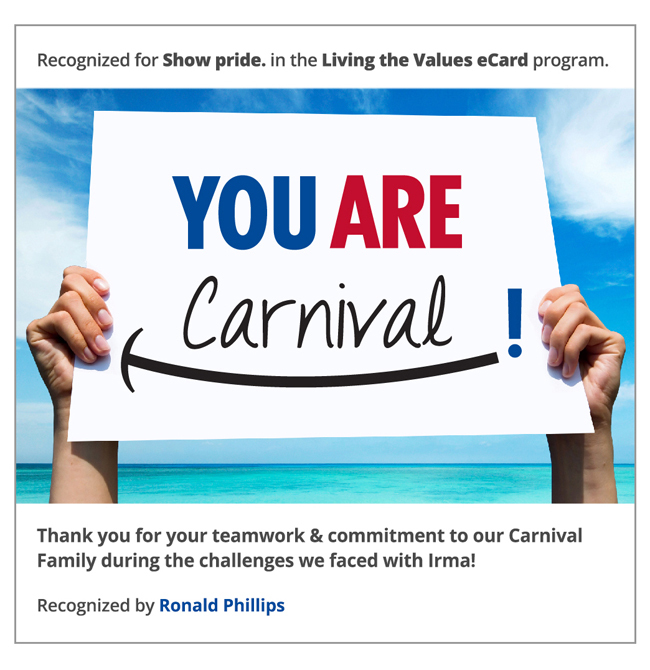 Earlier this year, Carnival Cruise Line launched a new employee recognition program to help build pride in the company and camaraderie between team members. When Hurricane Irma caused such disruption to travel plans, employees raised their game to take care of their customers. Carnival’s chief people officer recognized employees for their collaboration and hard work. His ecard prompted more than 400 likes and 130 comments within hours. “It always feels good to be appreciated. I will continue being of service each and every day,” one employee wrote. “So glad to be part of such a strong community and be recognized,” said another. Putting guests first is exactly the right instinct, but it’s hard to do without first putting your employees first. When they can see excellence in action—both the effect it has on guests and how hard their fellow employees are working to deliver that effect—you’re on your way to building a culture of ownership that meets your guests on their own “home” ground.